E-commerce in Germany continues to grow rapidly and there are no signs of stagnation. To stay ahead of tough competition in this new age of retail, retailers must continuously evolve with the new age customer and ensure that their e-commerce initiatives are targeted and customer centric. 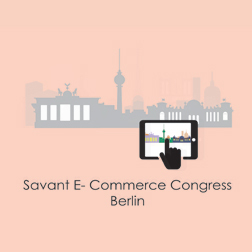 Savant E-Commerce Berlin is Germany’s premier e-commerce conference that brings together the best of minds to reveal the latest trends and practices in e-commerce strategies, design and technologies. It serves as a one stop shop offering a myriad of opportunities for both regional and international retailers willing to grow & expand in this lucrative market. The next Savant e-Commerce Congress will take place in the extraordinary settings of the 030 Eventloft at the Spreespeicher Berlin. Spreespeicher – the former granary of East Berlin – is a landmark in the city and offers a magnificent view over the river and famous bridge Oberbaumbrücke. The beautiful loft windows lead to an exclusive sun deck and allow a lot of light to come it, the perfect setting for inspiring presentations, dynamic sessions, private meetings and networking breaks.